Curt 45260 Trailer Ball Mount Draw Bars old part D-26. PART# Drop Rise Length Shank Dia. 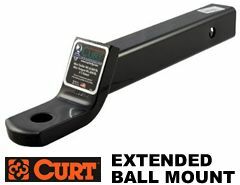 45260 2" 3/4" 12.25" 1"
The Curt 45260 extended length ball mount draw bar is a great ball mount for use in conjunction with the 64600 towing bike racks replaces old part D-26 . - GTWR 6000 lbs. towing, MTW 600 lbs max tongue wt. - Heavy Duty Class 3 (2" inch) ball trailer ball mount. - Has one inch (1") diameter hole for trailer ball shank. towing or for mounting our Towing Bike rack 64600 . - Available in Black Finish Only. - Wide range of sizes available. - Available for 1.25" and 2" hitch. - Mount hitch rack to RV bumper.